A deliciously unique way to serve pancit! This is a flavourful dish that can be whipped together in no time, perfect for a speedy supper. 1. Cut 2 spring onions into thin strips, place in a bowl of iced water and refrigerate until curled. 3. Cook the noodles according to packet instructions, then drain and toss with 1 tsp of Lee Kum Kee Sesame Oil. 4. Grease a 12-hole patty pan with a little oil. Divide the cooked noodles among the holes, pressing into the base and sides to form a basket shape. Brush with more oil and bake for 10 minutes. Remove the noodle baskets from the pan and place on baking tray. Bake for another 5 minutes or until crisp and golden. 5. Meanwhile, thinly slice the remaining spring onions. Heat a little oil in a wok, add chicken and cook for about 5 minutes. Add carrots, ginger, garlic, spring onion, Lee Kum Kee Premium Soy Sauce and Panda Brand Oyster Sauce and remaining sesame oil. 6. Stir to heat through. 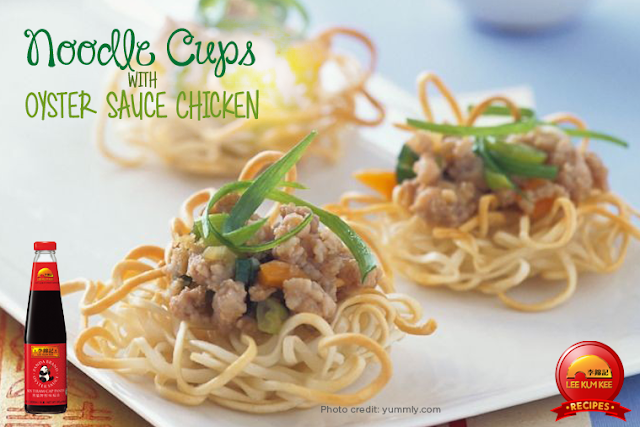 To serve, fill noodle baskets with the chicken mixture, drizzle with extra Oyster Sauce and garnish with spring onion curls.